From the writer-director-duo behind Misery comes another film about a bedridden character (Fred Savage), like Misery for children (not in a maths sense). Like Annie Wilkes, the boy’s grandfather (Peter Falk) dictates the course of a story within a story; that of a swordsman (Cary Elwes) and his quest to be reunited with his true love (Robin Wright). This framing device doesn’t really go anywhere, and only seems to exist to have the grandson praise the quality of the adventure story even though it’s nothing special. Opting more for swashbuckling Errol Flynn tribute than Shrek style fairytale subversion, the film finds Rob Reiner in oddly subdued mode. No attempt is made to question the genre’s true love or damsel in distress clichés, leaving you wanting a punchline that sadly never comes. Elwes looks the part but has none of Flynn’s charisma, while Wright makes little impression as the title character. 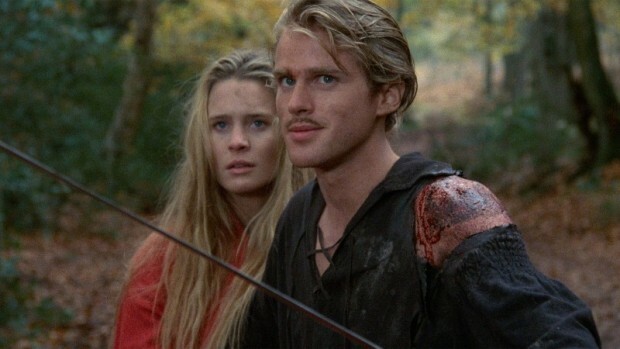 William Goldman’s quotable dialogue (and its online proliferation) has made the movie a cult favourite and there are some quirky supporting characters (well played by Mandy Patinkin, Christopher Guest and Mel Smith) but ultimately The Princess Bride‘s popularity is a bit like maths after all; I don’t get it.